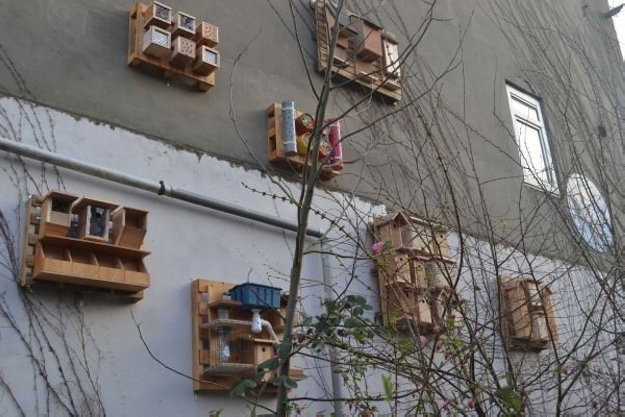 Hey guys out there, I need your special attention here please, how many of you are familiar with some bug or insect houses? Don’t think like I am a freak, go and ask the gardeners as they always want some good bugs head to their garden for some fine pollination. 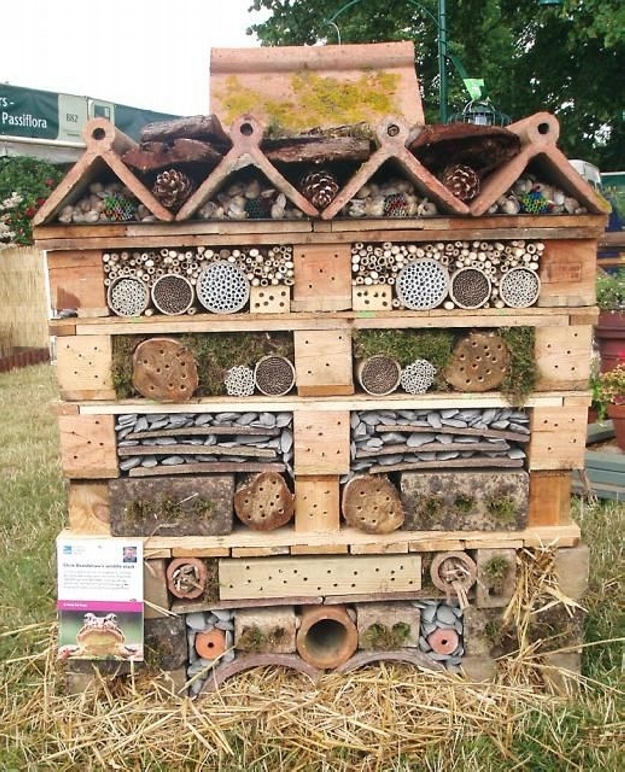 So this is something especially meant to target the gardeners or some other professionals who want a bug house for some professional or commercial purposes. Never under estimate the quality of shipping pallets, you would be pretty amazed when certain bughouse would be created right here with the same shipping pallets. The very first one is sort of inspired from the conventional structure that is used in human dwelling projects. We just thought to give the same kind of treatment to the bugs, just kidding man. 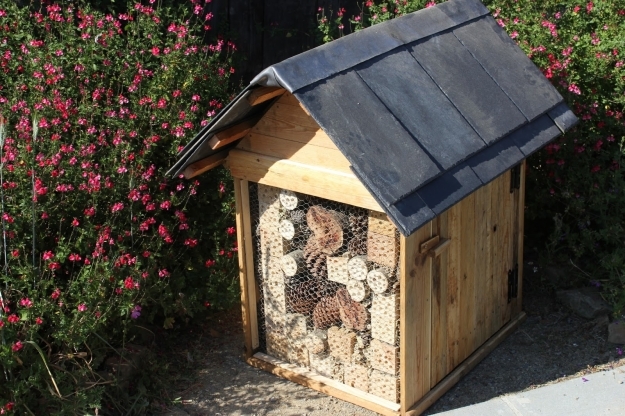 Be compassionate even about the bugs and get them this ideal insect house. 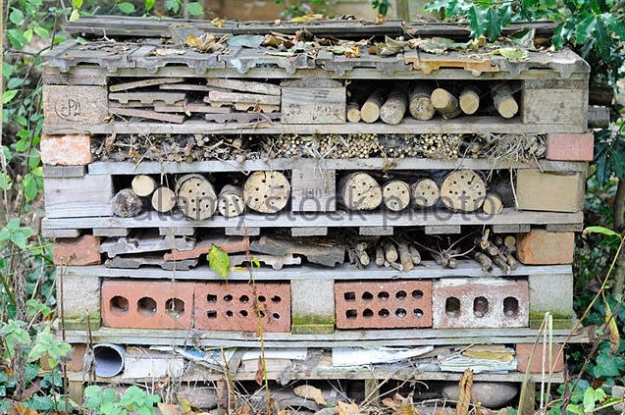 This is just a rough and rash setting of wooden pallets arranged in a certain pattern making the set up look like a typical bug house. 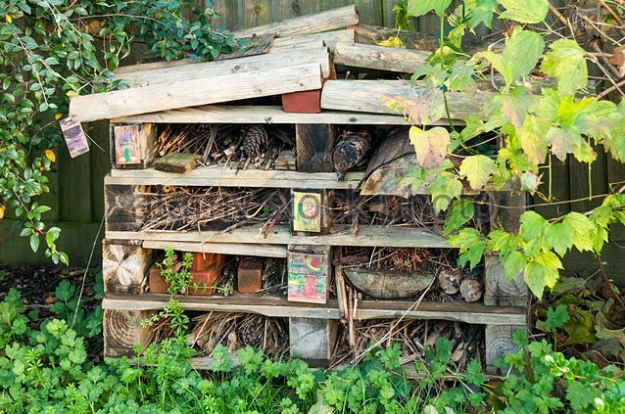 Don’t go on the ugliness of the bughouse, just look at the versatility and usefulness of the insect house. The messed up structure seems like an ideal place for bugs. 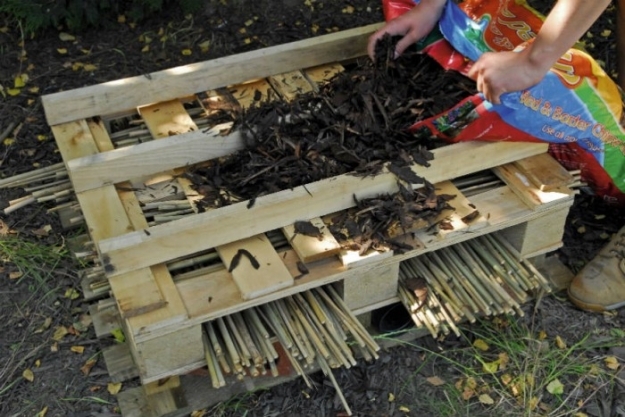 Using some additional materials inside a wooden pallet recycled bughouse is always something supportive. Just like the clay tiles and debarked wooden pieces placed inside. Bugs like to dwell inside or around them. Here again some straight shipping pallets are put one on another and covered with a beautiful hut shaped top. Piling up the whole pallets has never been so useful. 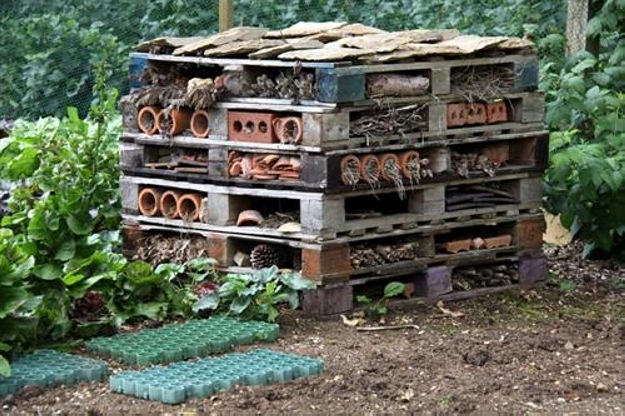 I mean this is just a great idea if you simply place the pallets in a certain manner and stuff it with some supportive material and eventually it becomes a wooden pallet recycled bug house, that is the easiest thing on planet earth right? 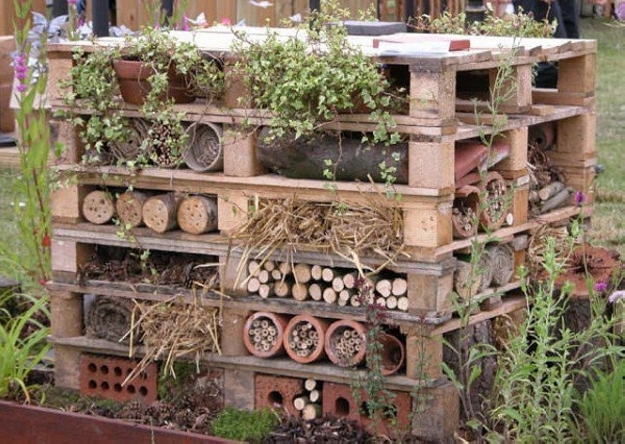 Keeping the pallet wood upcycled insect houses as simple as possible is just a great approach because at the end of the day bugs are not going to complain you about some bad accommodation they were provided with, infact this is the most natural way of attracting some good bugs that might help your gardening or certain profession. 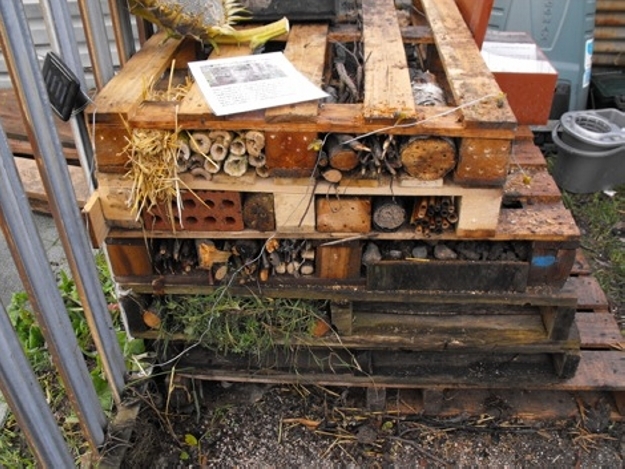 Look what we actually did here, same pattern, same supportive stuff inside the shipping pallets, and in the same manner they are piled up in an isolated corner of the garden, pretty away from the access of common visitors which makes it an ideal space for insects. 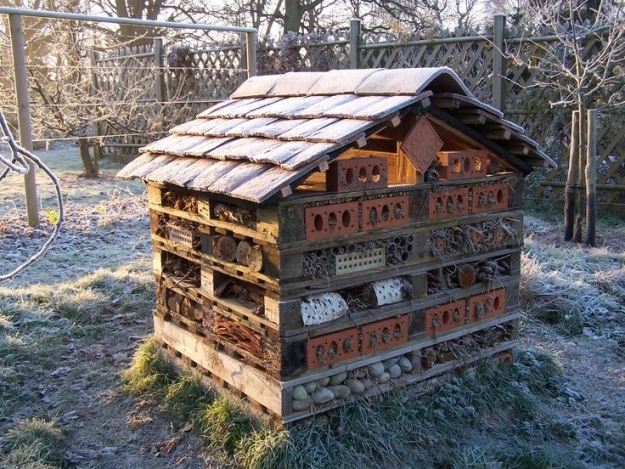 You know using some dry stones, walls, or old tiles in bug houses are always a pretty practical and smart move. Drilled holes in the materials encourage the bugs to leave their larvae inside them, so just to lure them we have arranged here for all the said materials. 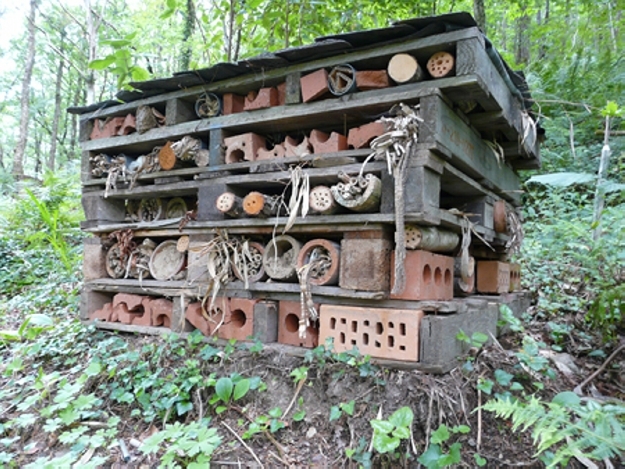 Eventually we just thought to end with a perfect rather ideal bug house with all the possible supportive materials. They are again stuffed inside some fresh whole shipping pallets, and the best arrangement is designed for the bugs. Hope they enjoy your accommodation and do some good for you.